Is it time to revise the old saw that everyone in the world is connected by just six degrees of separation? A study from French mobile carrier O2 has found that strangers are more connected to each other than they ever have been. 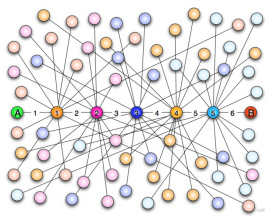 According to the study, the average person is now connected by just three degrees within a shared “interest” or social group instead of six. In fact, it found that people are usually a part of three main networks: family, friendship, and work. O2 asked adults across three different age groups — 18-25, 35-45, 55+ — to make contact with random strangers from areas all across the globe using only personal connections. By linking their shared interests, the participants were able to connect to that person in three person-to-person links. Stanley Milgram originally coined the term “six degrees of separation” in 1967 to show that everyone in the modern world was capable of connecting to another by linking people and interests. But in today’s world of social networking, links between strangers are closer than in Milgram’s day. According to Jeff Rodrigues, a social networking specialist that carried out the study, 97 percent of the participants said they felt more connected to people today than they ever have in the past and for older respondents, email and mobile phones were the key factors in reducing the degrees of separation. But for those in the younger generation, Facebook was the main factor. Text messaging was also mentioned as an important component in reducing degrees of separation. “What the study has brought to light is that the way we now interact means it’s never been easier to make connections and build networks of contacts,” Rodrigues said in an interview. It should be noted that the research is not the epitome of a real scientific study—O2 paid for it, after all. And anyone who has a LinkedIn account knows that it is still easy to find plenty of people who are more than three degrees away from you. But the study does underscore something we all know:more so than ever before, everyone is connected (even if it is only tangentially). Maybe it is time to revisit Milgram’s study in a more robust way. It could help silence the critics who believe Facebook and the rest are nothing more than places for kids to waste their time. Let’s face it – how often will you find one service or industry that can totally transform the way people are connected?